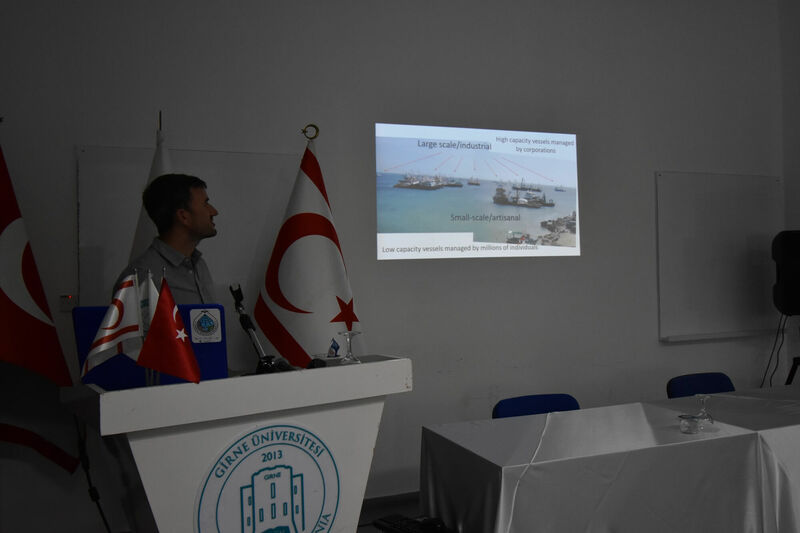 University of Kyrenia hosted a seminar on “Bycatch of Vulnerable Species in Small Scale Fisheries” delivered by Dr. Robin Snape from University of Exeter. Dean of Maritime Faculty, Assoc. Prof. Dr. M. Fatih Hüseyinoğlu, academicians and students attended the seminar. At the beginning of his speech, Dr. Robin Snape said that he was happy to be invited by Faculty of Maritime Studies and by Dean Hüseyinoğlu. Dr. Robin Snape stated that bycatch occurs because the nets also trap everything larger than the net’s mesh. 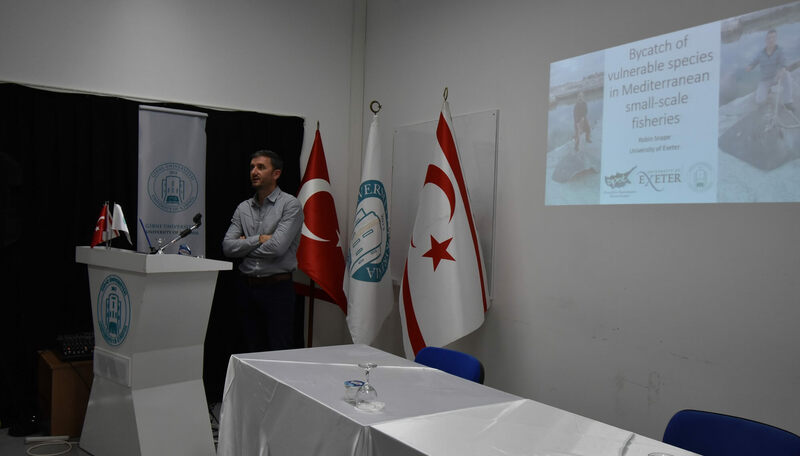 Snape underlined that the bycatch problem affects various species and during their researches in Northern Cyprus they have observed that sea turtles (green and loggerhead turtle) are common bycatch in commercial fishing operations. 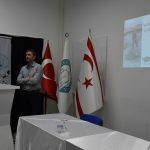 Dr. Robin Snape stressed that hosting 30% and 10% of all green and loggerhead turtle nesting in the Mediterranean, North Cyprus is of great importance for marine turtles. Snape provided detailed information including statistics on the small scale fisheries (SSF), large scale fisheries and various fishing gears such as trawl, purse seine, trammel nets, gill nets etc., and pots/traps, pound nets and gill nets which are used in the region. Dr. Robin Snape underlined that SSF operate close to the shore and fisheries must be well regulated. Snape mentioned his previous research on ‘sokan’ fisheries that cause a lot sea turtle deaths because they share the same habitat. 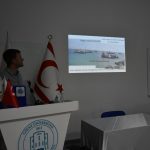 Dr. Robin Snape stated that to reduce bycatch LED lights were provided to Turkish-Cypriot fishermen who agreed to record their sets and landings and to photograph any turtles they caught. Snape said that” We are trying to have more information thanks to volunteers, our staff, local fisheries, environment departments and fishers. Political support is also important. Fishermen should be informed about how to safely release bycatch fishes and turtles, vulnerable bycatch species. Sustainable fishery means more fish, more money, happier fishermen and less bycatch”. At the end of the seminar Dr. Robin Snape answered the attendees’ questions.